Libyan Rebels Restore Old Weapons, Wait For New Leaders say they need heavier weaponry to push deeper into Gadhafi-controlled territory. They've asked Western governments for help, but have been told to wait. Meanwhile, volunteers in Benghazi are refurbishing some of the weapons Gadhafi's forces left behind. Volunteers attend a boot camp for rebels at a captured Libyan army base in Benghazi. Those with some military experience train for a week or two; the rest get three weeks or more. Rebels in Libya say they need more outside help to finish their 3-month-old rebellion against the government of Moammar Gadhafi. The nightly bombings by NATO are holding Gadhafi's forces at bay, but the rebels say they need heavier weaponry to push deeper into Gadhafi-controlled territory. At a rebel boot camp on the edge of Benghazi that used to be a Libyan army base, the buildings still bear the scorch marks that resulted from the recent change of management. Off in a corner of the compound, there is an outdoor machine shop, where Said el-Haddad and other volunteers are refurbishing some of the weapons Gadhafi's forces left behind. In peacetime, el-Haddad is a hydraulic engineer. But now he's restoring guns — a lot of them practically antiques. At the rebels' outdoor machine shop, they rehabilitate antique automatic weapons and sometimes redesign them. 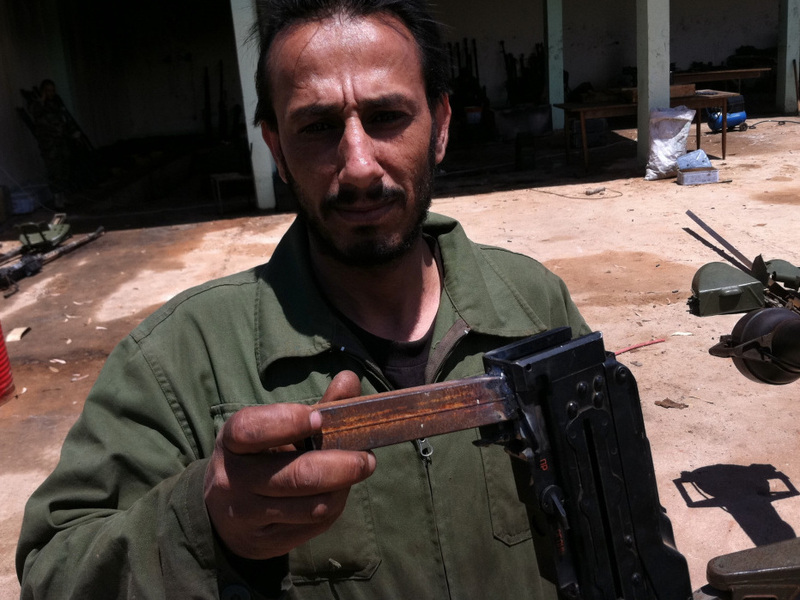 Saleh Likhfayfe shows off the new "grip" welded onto a salvaged machine gun. "Browning, yes? Made in USA!" El-Haddad notes of one of the weapons. It's a Browning machine gun, vintage World War II — but oil it up and it still works, el-Haddad says. There's also a stack of Russian PKT machine guns, salvaged from Gadhafi's destroyed tanks. El-Haddad says the PKTs were meant to be fired electronically, but those components are hard to come by, so he's welding on manual triggers. Asked if they work, he grins, grabs some ammo and fires off a couple of test rounds over the heads of the other men working in the machine shop. They don't even look up. You get used to high-caliber gunfire in Benghazi, though it's mostly shots into the air during the daily anti-Gadhafi rallies that tie up afternoon traffic. Sometimes they'll add a judiciously thrown stick of dynamite, just to spice up the demonstration. Rebel-held Libya is positively awash in weaponry, but not the right kind of weapons, says Ahmed Bany, the spokesman for what the rebels call the Free Libya Forces. We need almost everything ... Like night visions, you know the night goggles? We have no night goggles. ... Once it gets dark, we retreat, we go back. "What we have now is weapons for defense, for resistance only," Bany explains. Bany used to be a pilot in Gadhafi's air force. He says the rebels need better equipment, especially anti-tank weapons. Friendly countries have been generous with certain kinds of supplies, like diapers and food for the children. However, Bany says, "We cannot use the diapers as an anti-tank." Bany says the rebels have sent their weapons wish list to countries they assume are on their side — Italy, France and the U.S.
"The answer was 'wait,' " he says. " 'Wait in patience.' "
"We will wait in patience until they arm us." Marey el-Bejou, an airline pilot in peacetime, now commands 300 rebels. He says he hasn't seen any sign of new equipment at the front line. It's no surprise that Western governments are reluctant to send them weapons. NATO's involvement is based on a fragile international agreement to protect the Libyan people from Gadhafi — but not to arm them against their government. In fact, if the rebels do finally get weapons from abroad, it's probably in their diplomatic interest to keep it quiet. But Marey el-Bejou, an airline pilot in civilian life who now leads about 300 rebels, says he has not seen any sign of new gear at the front. "We need almost everything, from basics — like communication, we have no communications, right? Like night visions, you know the night goggles? We have no night goggles," he says. "That's why, I mean, once it gets dark, we retreat, we go back." The front line has been stuck for weeks near the oil industry town of Brega. And rebel leaders are increasingly frank in saying that, unless they get better weapons, they are done trying to push the front farther west. But the war-weary airline pilot sees things a little differently. 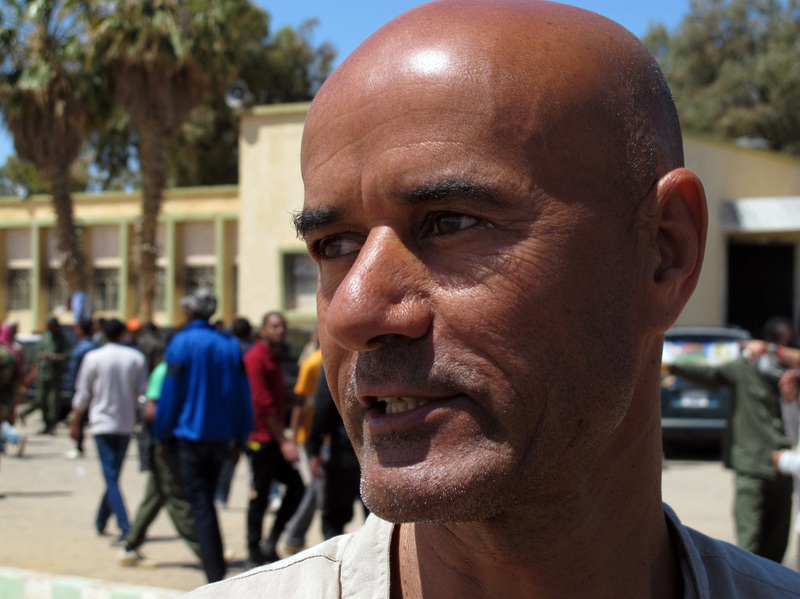 "I don't want weapons," el-Bejou says. "Give me high technology. Develop the country ... good education system, good health system, that's what I need — the infrastructure. ... But I don't want weapons." El-Bejou says new weapons and all of the training that would go with them would just drag out the war. He says he'd rather see NATO finish the job now — with a no-holds-barred assault on Gadhafi's troops.